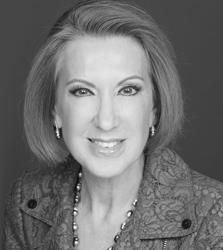 Carly Fiorina is a former business executive and former candidate for U.S. Senate in California. She announced her campaign for the Republican nomination on May 4, 2015. Fiorina’s business credentials include serving as CEO of Hewlett-Packard from 1999 until early 2005 although she was fired by the board after clashing with them over strategic decisions. Despite this, she is generally regarded as a capable executive and business leader, something she will need to demonstrate as someone who has never held elective office before. Her story as someone who rose from being a secretary at a real estate firm to corporate CEO is sure to be an asset on the campaign trail. Fiorina’s political experience essentially started in 2008 when she was an economic adviser to GOP presidential candidate John McCain and then became one of his leading surrogates, speaking frequently on the campaign trail on his behalf. Her experience on the campaign trail helped to launch her (unsuccessful) 2010 U.S. Senate challenge against Barbara Boxer. Fiorina’s candidacy benefits from her history as a business leader who isn’t part of the political establishment, and she herself has noted that it would be more difficult for Democrats to use the “War on Women” meme should she be the Republican nominee. Her views appear to be uniformly conservative, which will appeal to voters within the mainstream of Republican thought. Her fundraising has generally lagged well behind those of the top contenders, but she is wealthy enough to put additional resources into her campaign if need be, although a largely self-funded effort is unlikely. Fiorina began the race as a significant long shot, but stellar debate performances led to rising support in the polls, including a two-week period in late September and early October where she was in third place nationally. Her campaign was unable to capitalize on her newfound prominence, however, and she has since fallen back into the third tier of candidates. She remains an underdog for the Republican nomination but with an unexpectedly high finish in one of the early contests she could potentially resurrect her campaign and once again become a contender for the nomination. Although relatively new to the political scene, Fiorina does appear to hold strong conservative values and principles. She has spoken persuasively and compellingly in support of social issues, national defense and free markets, and her position as chairwoman of the American Conservative Union Foundation should be enough to satisfy any who might question her conservative bona fides. The raw numbers of Fiorina’s performance as CEO of HP include a doubling of revenue while the stock value was halved,33 and 30,000 employees were laid off during a period that included the bursting of the tech bubble. She is credited with having a strong stage presence and polished speaking style, and her speeches to Republican audiences so far have generally drawn high praise.41 Her performance in the first Republican debate, where she was relegated to the “undercard” event for candidates who didn’t rank in the top ten in national polls, was considered to be excellent and propelled a surge in support for her. One National Review article on her noted, “Fiorina is a very good talker herself: natural and unstumbling. Her usual tone is warm, though she can summon an edge. At the early-morning coffee, she speaks in a quiet and determined voice, mic-less…she talks fast and uncondescendingly. She does not put on a Mr. Rogers voice, as many politicians do. (I speak of the late Fred Rogers, the genial host of the children’s show Mister Rogers’ Neighborhood.) She knows how to manage applause. She does not permit it to disrupt her flow…”42 All in all she has shown herself to be an exceptional communicator on the campaign trail. Since Fiorina has not served in public office yet, her policy positions are known mostly through public statements made, many during her 2010 election challenge to Boxer as well as statements made on the campaign trail. She has stated she supported the extension of the Bush tax cuts as well as lowering the marginal income tax rate, eliminating the capital gains tax on small-business investment, eliminating the estate tax and opposing Internet taxes.48 In 2010, Fiorina signed the Americans for Tax Reform’s “no new taxes” pledge49 – often considered a key document for candidates to sign to demonstrate their commitment to fiscal restraint and responsibility. While Fiorina has yet to release a detailed tax reform plan, she has said she wants to “lower every rate, close every loophole,”50 and during the third Republican debate she said she believes a new tax code should be roughly three pages long,51 and she specifically pointed to a three-page proposal by two Hoover Institution scholars in 1995 to implement a 19 percent flat tax with substantial personal and dependent deductions.52 It is not clear what, if any, adjustments Fiorina would make to such a plan. California labor unions attacked Fiorina incessantly throughout her 2010 campaign,63 although there doesn’t seem to be a record of any interaction (or any conflicts) between her and unions throughout her business career. Fiorina is a supporter of the death penalty131 and of reforms that will redirect nonviolent drug offenders to programs instead of putting them in prison. Probably Fiorina’s most evident and prominent vulnerability is the very public criticism during her time as Hewlett-Packard’s CEO in the early 2000s. This ultimately resulted in her departure from the company. However, in the years since her departure, some in financial circles have vindicated her decisions and actions while CEO. With that departure came a significant “golden parachute” that had a cash value of $21 million plus an estimated $19 million value in stock and pension benefits.157 She has an estimated net worth of $80 million.158 In an election cycle where populist messaging will likely be common, these figures are a vulnerability for Fiorina. This will likely be exacerbated by claims that Fiorina refused to fly commercial during her tenure as CEO and instead used private jets and traveled with a personal hairdresser and beauty stylist162 instead of business advisers. Finally, Fiorina will need to address concerns that she has never held political office before. Her tenure as CEO of a major corporation will likely help to offset this concern, but the fact that she was later fired will somewhat diminish this credential.